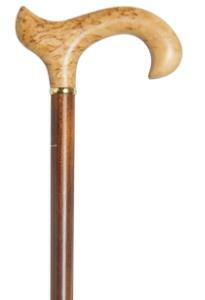 A very smart walking stick, crafted to the highest standards. The supportive derby handle is made from birch wood, prized for its interesting grain pattern and warm tones. It is mounted on a beech wood shaft that has been stained an attractive cherry colour, providing a sophisticated contrast with the handle. The stick is fitted with a smart brass collar and a discreet, non-slip black, rubber ferrule. A perfect cane for a connoisseur. Overall height 92cm (36"). Ferrule diameter 16mm.